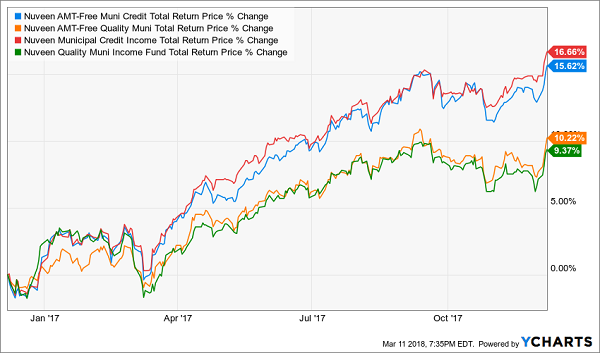 From Contrarian Outlook: Municipal bonds are off to a slow start in 2018 – which is usually a bullish sign for these tax-free payers. “Ticking time bomb” is a scary phrase tossed around with munis. The story goes that state and local government have pension obligations they won’t be able to pay someday. But income-hungry investors are picking up tax-free nickels on the train tracks in the meantime. Historically, munis have actually been the safest bonds you could have purchased this side of U.S. Treasuries. While we read about the disasters in financial headlines, the reality is that very few of these loans tend to default. Muni bonds have averaged default rates below 0.2% for decades. But 0.2% isn’t quite zero, so I wouldn’t buy a basket of munis cobbled together by a dumb computer algorithm. Pensions are a potential concern that needs to be evaluated on a case-by-case basis. We need a smart muni manager who can curate a portfolio that’s safe from credit risk with yields worth our while (which I define as 5%+ and Federal tax exempt). This is doable – and we can even get our management fee comped if we buy right. More on this later. Munis sold off on the heels of the 2016 presidential election because investors mistakenly worried that lower individual tax rates would hurt demand for munis. While rates have come down, they’re still quite high for high earners. 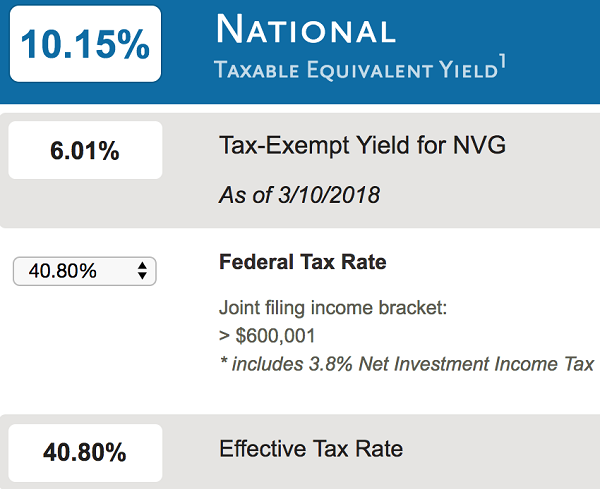 For example, a 6% tax-free yield from Nuveen’s AMT-Free Municipal Credit Income Fund (NVG) is the equivalent of a 10.2% income stream for someone in the top bracket! Tax-free income is still attractive, and demand for munis should remain strong. But will they be able to generate the income levels we’ve seen in the past? For example, NVG’s average coupon today earns it 3.9% in tax-free annual income. The fund then borrows money for 1.1% and buys more bonds to boost its portfolio’s yield to 5.4%. You and I, meanwhile, can buy NVG for just 91 cents on the dollar today (thanks to its price’s current 9% discount to its NAV). Which boosts our yield to 6% (which is before we consider tax advantages). It’s good living for everyone involved when money is this cheap. Muni funds borrow at rates determined by the SIFMA Swap index, which is published by Bloomberg. For the years leading up to the Fed’s current rate hike cycle, SIFMA was less than 0.1%. These funds were basically borrowing for free! The folks at Nuveen correctly called the recent top and subsequent drop from 1.7% to 1.1% in December. They believe SIFMA will stay around these levels. Of course they also have several tax-free horses in this race (as we’ll see in a minute). Regardless, rising SIFMA is the potential problem we should keep an eye on (it’s published every week by Bloomberg). Muni funds in general seem to be fairly priced here. Discounts are on the generous side, up to 12.6% amongst my favorites. This margin of safety is appropriate given the potential for more expensive borrowing costs. Has generated 6%+ returns on its NAV since inception. Notice a pattern? It’s no coincidence that Nuveen, Invesco and BlackRock dominate the muni leaderboard. These firms have an “unfair advantage” over their competitors and especially over any individual money managers or investors who want to buy munis directly. Simply put, they get the first phone call. These guys are buying bonds (and securing bargains) that you and I (and even bigger players) never get access to. Fortunately, we can bridge this gap of unfairness simply by purchasing these funds. And since they trade at discounts to the value of their holdings, we can actually get our management fee “comped” with a free money kicker to boot. And while I like these muni names today, I actually LOVE another group of monthly dividend payers even more today. These cash cows are setup to continue dishing secure 8%+ yearly payouts with double-digit price potential to boot. My “8% Monthly Payer Portfolio” focuses on the best monthly dividend buys at any given moment. As you can see, the yield alone makes this strategy quite compelling if you’re interested in retiring and making a living on your dividends alone. Now many retirement experts pitch real estate as the best way to bank monthly income. But this grandma isn’t hustling to collect rent checks, or fix broken light bulbs. She’s simply collecting her “dividend pension” every month, which is 100% funded by her stocks and funds. Actually her monthly salary is more than 100% financed – which is why her portfolio has grown by $10,000 as she’s withdrawn $3,000 per month. The iShares S&P Natnl AMT – Free Munpl Bd Fd (MUB) was unchanged in premarket trading Wednesday. Year-to-date, MUB has declined -2.13%, versus a 3.69% rise in the benchmark S&P 500 index during the same period. MUB currently has an ETF Daily News SMART Grade of B (Buy), and is ranked #7 of 38 ETFs in the Municipal Bonds ETFs category.